OK found the advanced menu, dont know how I overlooked that. and starting and ending chs should be the same? OK, now where to I get bootsector total so that I can add one (+1) an enter it in the last box? also, I think I should change disk ID too right? The total sectors is in the next tab : enter 2048 if asked an offset. Dont bother the disk id. I should have done that first because when I went back the boxes had cleared. if I dont change disk ID then when I boot this .img, if I add the old USB HDD I copied cloned, it wont cause windows problems? About the disk id, i would worry about that later. smalltotalsector or largetotalsectors? I dont see any boxes with only "total sectors"
totalsec box is blank? the cloned USB HDD is ntfs. You had a partition image to start with right? Screenshot the boot sector screen here please. right, made by this same clonedisk just an hour ago then I combined it with the header.img as you suggest and the new image that was made is what I am working with here now. You need to edit the mbr and the bs. Then you end up with a disk image containing your partition. just mentioned it in case. was not expecting this to happen so I will reopen the img. I did the partition image, then appended header and now working on edit mbr. but may need to start over if I need to reload the image before apending to get correct sector value of that img? This is not a boot sector. At offset 2048 you should find eb5290 i.e a JMP instruction (first field of the boot sector). You either failed to append 2048 sectors or you failed to make a partition image. As a test edit the boot sector of your partition image at offset 0 : you should read the correct JMP instruction mentionned above. when I made header.img, it was only 1mb and I didnt do anything to it before I copy /b with the partition image. for clairification; to get the boot sector value that I need in order to add (+1), do I get that from the combined image or the original partition image that clonedisk made? Dont modify header.img before appending. Get totalsec in the boot sector either at offset 0 in your image before appending or at offset 2048 after appending. I am off for today. OK, thanks for the effort to help today. I may can figure it out from here. I will report success if I can. edit: if I let it set the default value of 63 instead of changing to 2048 then the sector box has values. so I think I need different chs values than what is in your examples. well I redid everything and it seemed to work out but when I tried to boot through grub4dos I get error5 "partition table invalid or corrupt"
You missed the hiddencsec part in the boot sector (step 5 in my procedure). Lets fix that first : bootsector.hiddensec = mbr.sectors before. (double click on the hiddensec field to edit it). And ensure that the boot sector is at offset 2048, not 63. Also, did you apply a boot loader (in mbr tab)? This will also fix the mbr signature (AA55). If after doint these 2 actions abobe, it still does not work, we will reconsider the C.H.S. bCHS=eCHS=1023/254/63 is the a convention of saying "dont look at CHS" : maybe grub4dos does not like that. If not we will try bCHS=1023/0/1 and eCHS=1023/254/63 which also means "dont look at CHS". Or else we will use a correct bCHS=0/32/33 (to reflect sectors before = 2048). I did use these steps and booted my disk image fine in QEMU but did not test G4D. If Wonko is nearby, he is best to guide us there around G4D + CHS. I bet he will probably not like my approach "dont look at CHS"
But again, fix the bs.hiddensec and mbr boot loader first. 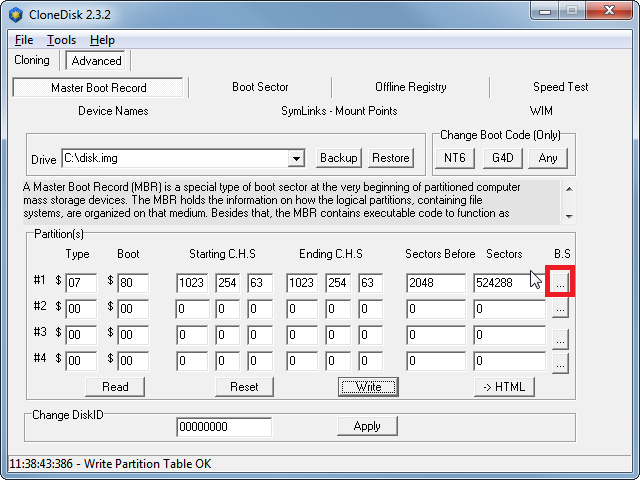 In latest version, in the MBR form, there is a new button that will take you directly to the BootSector (using the sectors before MBR field). Download latest version (dated Feb 02), as I did some minor changes to ease this procedure. Oh, I seemed to have thought that step was optional for some reason..
now, I open the .img and at the popup prompt for offset I enter 2048 (it has 63 default showing) then when I dbl click the hidden box I get a popup "read file error: the handle is invalid"
FWIW I also skipped step 4 thinking that it is optional because I do not have a W8.1 system. Im guessing I should go back to that part too. edit: I just noticed that I only have option button for NT6 and not G4D or ANY to change boot code as in your screenshot. is this to be expected? About your edit : you are looking at the wrong screen! Bootsector screen has only one NT6 button : you dont need to re inject it as you already have one. MasterBoot Record screen has 3 buttons : use the NT6 one (I assume you run windows). -and make sure you dont get confused between MBR and BS (this is what I put screenshots in my procedures). ignore clonedisk_.exe : should not be there.